What’s your pancake mile time? Photo by Brigitte Tohm on Unsplash. Image description: A giant stack of plain pancakes on a wooden cutting board. I have no idea. I confess that even before I stopped running I’d have no interest in finding out. My constitution isn’t built that way. I have a hard time eating pancakes and then riding my bike! But you could register and find out your time here. Thanks Chris L for telling me about this over lunch! What is a Pancake Mile anyway? Just eat a pancake, run a quarter mile. X4. April 7, Elmira, Ontario. Event capped at 120 entrants. 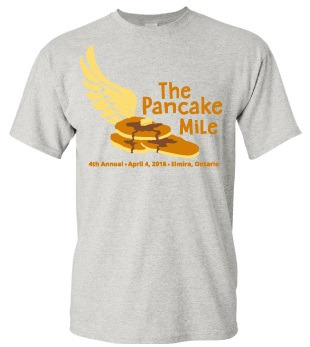 “Winged Pancake” t-shirt to all participants in timed and untimed events. Delicious certified 50g Pancakes and optional Maple Syrup! The Elmira Maple Syrup Festival is a local food festival that has been a pillar of the community for over a half century. Recognized by the Guinness Book of World Records as the World’s Largest Single Day Maple Syrup Festival when 66,529 people attended in 2000. Attracting even more people today, this festival has reached attendance levels close to 80,000. There are lots and lots of these “eat x, run y” or “drink x, run y” events. I’m not sure any of them have ever appealed to me. There is a bike race that involves donuts I might be able to manage. The most famous of course is the beer mile. See Feeling proudly Canadian and curious: Do you know your beer mile time? and Guest Post: 5 Beer – 5k Race Report . What do you think of these faces? Fun? Fun but you wouldn’t do it? Or are you more generally grumpy about gimmicky exercise. I don’t drink so I wouldn’t do the beer mile (even if I could run, which I can’t) and I’m grumpy about the the skirt chaser race and I wouldn’t do the XRated Run. Oh, I’m also grumpy about the Prison Break! run too. I was going to say that I’m a big liberal about these things and I’m all “you do you.” But maybe that’s not quite right. Anyway, of the food and drink related races do any appeal to you? Which ones and why? Why not?